As we celebrate Thanksgiving Day in the US, we wanted to extend our gratitude to you. For the past ten years, Rowan Tree Foundation has been working toward growing our community. The goal has always been to increase the awareness of the work we do in order to spread the word to more and more people that support is available when you lose a child. We are thankkful for you, and your support, but most of all for allowing us to be a small part of your healing. 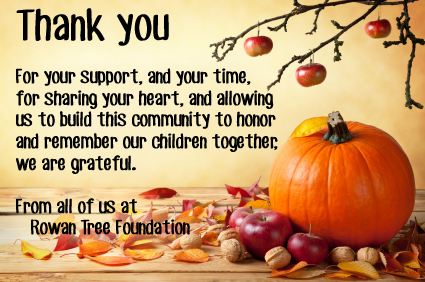 We are also thankful for all of our volunteers, sponsors, and donors. We can’t do all that we do to support grieving families without the gifts of your time and financial contributions, and good will. Thanksgiving can be a difficult holiday for many bereaved parents, especially when their loss is new. New grief covers everything. Be gentle with those around you who are missing their child today. Say their child’s name. Give them a squeeze and let them know that you see and that you care they might be hurting. If you are remembering a child and find it difficult to face the holidays, be gentle with yourself. Give yourself permission to do less. Tell your family and friends that you’re struggling. Talk about your child. Light a candle for them today and every day. Be aware that sometimes family and friends are looking to follow your lead when it comes to remembering your child, especially at family gatherings. It’s okay to be the first to take that step. Most of all, know that you are not alone.